This pristine FJ40 was sold at RM Sotheby's auction in Scottsdale, Arizona in January 2016. 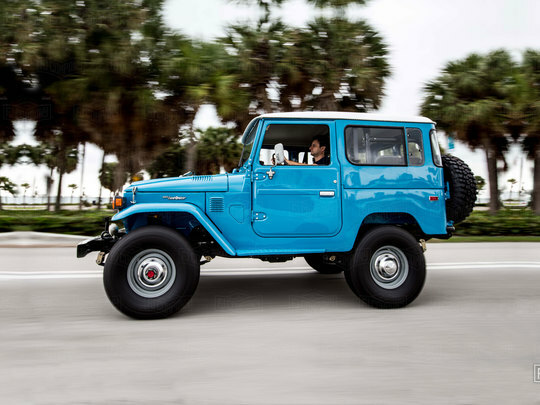 Although this is an american version of the FJ40, this vehicle enjoyed single-family ownership in Colombia, where it was used in the city and for occasional trips to rural farms. As is common with similar versions, it was delivered from the factory with options such as front and rear heater, and a defogger system for the front-side windows. After arriving at The FJ Company in mid-2015, it was put through a concours-quality restoration which was fully documented and photographed. The frame was powder-coated, and two coats of urethane sealed the chassis and floors. Two coats of anti-corrosive primer preceded multiple coats of the Toyota's original Sky Blue paint, with the top of the factory hardtop finished in Cygnus White. Inside, the roll bar was repainted, the door panels, dash pads, and headliner were replaced, and the seats were re-upholstered in the correct grey material. New windows were installed and new seals throughout were used. The matching numbers 4.2-liter six-cylinder engine, four-speed transmission, and four-wheel-drive system were systematically rebuilt, using Toyota OEM parts wherever possible, and a new Old Man Emu suspension was fitted. The wiring harness was replaced, along with all fuse blocks and relays, and the gauges were refinished. The original heater was overhauled, a new Toyota OEM A/C installed, and all fixtures, nuts and bolts were zinc-plated.